Ten years ago, like the rest of the country, Ohio faced an economic crisis. Not only did the state endure the housing and financial near-collapses that marked The Great Recession, but also faced the meltdown of its mighty manufacturing industry – which helped build America. And native son LeBron James was headed off to Miami. Times could not have been more bleak. Today, Ohio is like walking into a new world. The state’s innovative, forward-thinking re-blend of its economy, emphasizing tech, higher education, smart manufacturing, and government-private sector partnerships, has generated a strong resurgence. Not only that, but companies and workers from throughout the country and world are streaming into the Buckeye State, attracted by low-cost, high-quality living, the state’s many natural wonders, and ideal work environments. The state has not only righted the ship, but become a shining example of how to lift a huge economy, seventh largest among states, from the ashes to the stars. After growing slowly but steadily the first half of the decade, it has roared to the forefront in the second half. If Ohio were a country, it would rank 21st economically. Per capita income continues to rise, but more importantly, so do the variety of jobs. Job growth has accelerated statewide, now ahead of the national average. According to Ohio Department of Jobs and Family Services, Central Ohio has 5.8 percent greater employment than in 2008. Next is Southwest Ohio, at 5.1 percent, Northeast Central Ohio (Cleveland, Cuyahoga County) with 4.2 percent and Southern Ohio at 4.0 percent. The significance? All of these areas suffered tremendous job loss when the manufacturing sector bottomed out. They’ve completely regenerated their economies with new layers of jobs and innovation. Partnerships and collaborations are a critical piece of Ohio’s growth. Economic development coalitions have formed statewide. These vital partnerships of government, the private sector, and education are attracting new jobs and spurring growth from within. Such groups as the Cuyahoga County Department of Development, City of Cleveland Economic Development, City of Springfield Economic Development, GROW Licking County, and Ashland Area Economic Development have brought growth to their areas while always focusing on the future. Other creative partnerships include the City of Springfield’s work with Wright Patterson Air Force Base, the U.S. government, DriveOHIO, and private industry to test and build a drone fleet that does everything from traffic monitoring to spraying fields and delivering packages. It is a unique opportunity in the place where the Wright Brothers developed our ability to fly – but that’s the point. Unique opportunities are springing up throughout Ohio from this approach. Another big push has come in startup incubators, always an attractor of young talent. 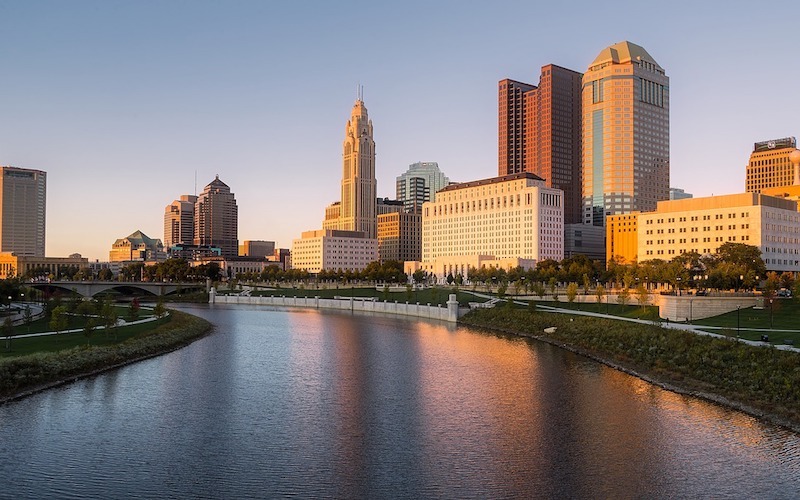 It began in 2006, when Ohio invested $1.6 billion in Ohio Third Frontier, the seed of today’s 25 operating incubators and accelerators statewide. On top of that, more companies are creating their own innovation labs. Today, Ohio is home to 55 of the Fortune 1000 companies, with many others operating facilities statewide. Facebook is the most recent to add their name to the list, now building a huge complex in Licking County in central Ohio. According to JobsOhio, corporate operating costs for the many tech implants and transplants – including the highly touted startup incubator firm Plug ‘n Play – are 70 percent lower than California’s Silicon Valley. Add to that more than 200 academic institutions now ramped up with IT and tech curricula and training programs, and the ground for developing and keeping new talent is fertile and strong. These same 200 institutions are re-training older blue-collar workers in 21st century skills, creating new optimism for them after a 30-year decline in manufacturing hit rock bottom early in this decade. From smart manufacturers to distributors to tech companies, Ohio is attracting younger workers more likely to roll up their sleeves to adjust robotics or run an IT center than punch the clock at the plant. Still, like their predecessors, their hard work feeds families and economy – and they can guide their future course like no generation before. “The employee is in the driver’s seat,” Ohio Carbon general manager B.J. Harvey said.